Chinese President Xi Jinping on Sunday sent a congratulatory message to the 27th summit of the African Union (AU), which kicked off on Sunday in the Rwandan capital of Kigali. Xi noted that “the AU has played an important role in promoting unity, self-improvement as well as integration of Africa” said state news agency Xinhua. The African Union which represents 54 states, wants to abolish the need for Africans visiting African counties to require a visa by 2018 and has officially launched the African Union single passport on Sunday. Outgoing Chairperson of the African Union Commission, Dlamini-Zuma issued the first two copies to Chairperson of the AU and Chadian president, Idris Deby Itno and Rwandan president Paul Kagame. The AU also wants to establish a free trade deal across the continent by 2017, as intra-African trade costs more than any other region. On Sunday, Chinese President Xi sought to highlight the extensive trade and development ties with the continent. “China attaches great importance to its relations with Africa and will push for the implementation of the 10 major cooperation plans announced at the Johannesburg summit, so as to lift the China-Africa comprehensive strategic cooperative partnership to a higher level for the benefits of the Chinese and African peoples,” said Xi. He was referring to the Johannesburg summit of the Forum on China-Africa Cooperation in December 2015. During that summit in December, Chinese and African leaders discussed cooperation strategy and jointly drew a blueprint for future cooperation, said Xi. Xi had announced $60 billion in funding to promote cooperation and support development efforts in the African continent. This includes $5 billion of interest-free loans and $35 billion in preferential financing, export credit lines and concessional loans. Xi also committed $1.2 billion for work on power plants in Zimbabwe and pledged to invest 94 billion rand ($6.5 billion) in infrastructure and other projects in South Africa. Exports to China rose to 6.5 per cent of Sub-Saharan Africa’s GDP in 2014 from 2.4 per cent in 2005. Meanwhile, the impact of the Chinese economic slowdown on African growth prospects is overstated, experts say. 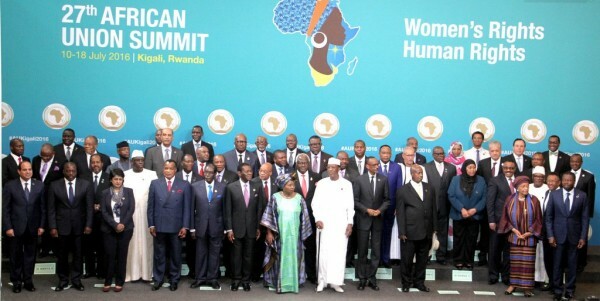 On Sunday, AU Chairperson Dlamini Zuma spoke about the many successes of the Commission: championing the rights of women, the launch of the African passport and championing youth involvement in the continent’s journey into the future. We suggest to the Summit for consideration, that Member states issue the #AfricanPassport to their citizens, within their national policies. In her opening address at the AU summit on Sunday, Zuma referred to the recent fighting in South Sudan, where fighting between forces loyal to the president and his rival has plunged the nation into its worst crisis since the end of a two-year civil war. “South Sudan, Africa’s youngest nation, whose people in their five years of independence have experienced violence and trauma no nation should bear… We therefore welcome the bold decisions taken by the IGAD + 5 Mechanism to once again give hope to the people especially the civilians of South Sudan,” Zuma told African leaders. Forces loyal to South Sudan’s President Salva Kiir and Vice President Riek Machar engaged in five days of street battles with anti-aircraft guns, attack helicopters and tanks until a ceasefire was reached on Monday last week.